This chapter provides an introduction to metal hydrides of A6B23 compounds. The hydrogenation properties of A6B23 compounds have been mainly studied for binary and pseudobinary compounds with A = Y, Th, and RE and B = Mn and Fe. They absorb generally less than 1 H/M and form stable hydrides with low equilibrium pressure near RT; the H reversibility is therefore limited. 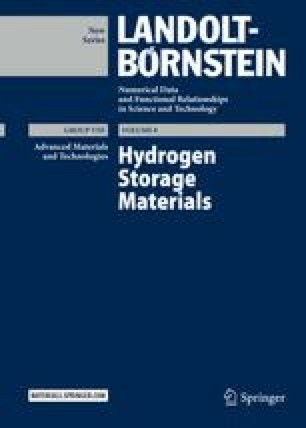 For these reasons, they have not been used for hydrogen storage applications compared to other intermetallic compounds (AB, AB2, AB3, and AB5) which can absorb larger H content. Nevertheless, the hydrogenation properties of A6B23 hydrides have been investigated in particular to study the influence of hydrogen absorption on their magnetic properties.